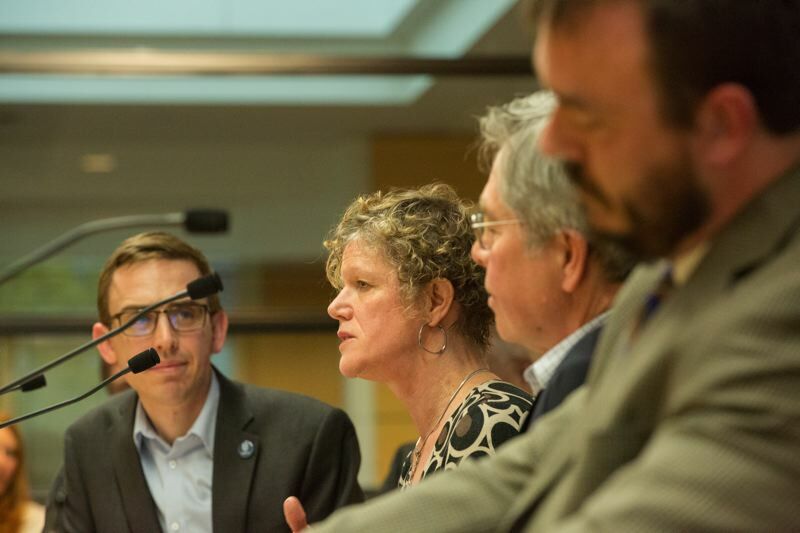 Metro pols and economists meet to estimate growth and land use needs in the next 20 years. Portland is facing a clash royale as Millennials and retiring Baby Boomers compete for the same types of property: close-in urban dwellings where they can walk to services, see their friends and live a clutter-free existence. So said Sheila Martin, director of Portland State University's Institute of Portland Metropolitan Studies. 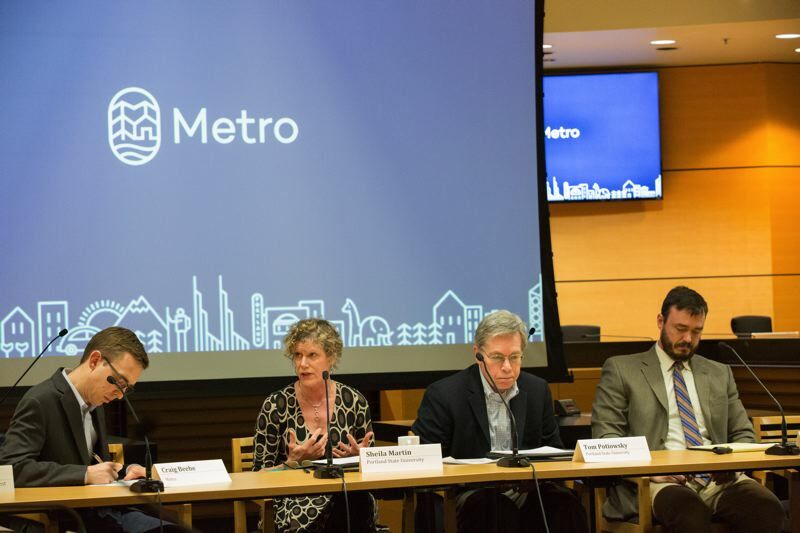 She was on a panel at Metro's headquarters Wednesday evening with Tom Potiowsky, director, PSU Northwest Economic Research Center and Bill Reid, principal, PNW Economics and also a PSU professor. Moderated by Craig Beebe, the panel discussion was entitled The Trends behind Regional Population and Employment Growth: Migration and Demographic Change. "One factor in people returning to the central cities is safety. There's lower crime,"said Martin. "As a retiree you're going to lose your license at some point, and if you want to not be isolated, you need a place that's walkable. Unfortunately, these are the places where Millennials want to live, so that sets up a competition." Martin stressed that we should continue to invest (private and public money) in our central cities. "It's been a wonderful resurgence of cities in the last two decades," she said. Without mentioning the term affordable housing, she noted: "I worry we will end up being an enclave for the rich and we won't have options for varieties of housing that people of different incomes can afford." The evening's talk was directed at an audience of the region's power players such as Beaverton Mayor Denny Doyle, Jerry Hinton of Gresham, and Linda Simmons of TriMet — all of whom want to know what big issues they will be facing in 20 years as demographics change. The Metro Policy Advisory Committee is working on its recommendation to the Metro Council for its urban growth management decision. The issue is Metro has to estimate whether to move the Urban Growth Boundary out or not to make room for more houses and factories. Last time, it did not. At that time Bill Reid disagreed, and on Wednesday he brought up the fact that the Metro region only has one plot of industrial land that is rated Tier 1. That means having power, water and roads and able to be developed in a year or two. "There's a severe supply problem, and it's holding cities back. It's a big risk for employment looking forward," Reid said. Tom Potiowsky said, a little ironically, that looking back at the Great Recession, "We learned that recessions are not a good thing." Still on the subject of recessions, Bill Reid said that the Portland area was fortunate in that when the recession hit, because of good land use planning, there were not sprawling acres of single family homes and master planned communities left vacant by bankrupt firms. However, when growth restarted and in-migration brought in new workers with money, there was not enough capacity to keep prices from rising. "Looking back on what we missed, we need to make sure we don't have a mismatch next time the inevitable business cycle happens," said Reid. Moderator Beebe asked them what big issues they were worried about for the economy. Potiowsky said it's the trade policies coming out of the White House. "Tariffs across the board, I'm worried about a trade war. And with all the goods coming from Oregon to China, we would be impacted." He added that the Tax Cuts and Jobs Act was "not wise to do at full economic strength, the economy doesn't need it right now." He also noted income inequality is a worry. Sheila Martin said that changing demographics will change business models — and land use. For example, healthcare. "There will not be enough hospitals to serve the aging population. On the horizon is a change for their service model, requiring less space, which will probably be better for people. It's not that much fun being in hospital." Japan is an example, with a fertility rate below replacement. Portland risks going that way. "We have to worry about the ratio of people who are working to not working, because we need workers to pay taxes and Social Security. Everyone hates in-migration, but the other situation would be difficult as well." Seattle, incidentally, was held up as a good example, since it is growing faster than Portland but has "gotten its act together with light rail." Martin also said that the way managers find employees will change. "Right now we use our social networks, which is perpetuating the look of the workforce. As we have an exodus of Baby Boomers and an increase in people of color in our population, it's essential we be more inclusive in who we hire." She said it'll be less about "whether someone fits a culture," which is all about "looking for people who look like us." Instead it will be about training, and she cited firms that are hiring autistic people and the formerly incarcerated. "Opportunities are opened up by a tight labor market, and employers are forced to look at pools of labor they may not have considered before." Potiowsky said that while he did not suggest income redistribution at the state level, he was worried about how the middle class was not gaining good jobs quickly enough. "You don't want a situation where the Haves and Have-Nots break down into social unrest." He also said of Millennials that "This is a demographic cohort putting off traditional expenditures: car, home, starting a family." One audience member asked what the Baby Boomer median income was when they were 21, and how it compares to now. Potiowsky said he did not know, but he knew that when he was a student he felt he could never afford to buy a house but owns one now. Someone else asked about automation and how it could render unemployed millions of drivers, or "10 or 15 percent of the population." Reid said he thought that was an exaggeration, that Artificial Intelligence won't be viable for a long time. Potiowsky said he was hopeful about technology causing change. "Where did all the elevator operators go? I'm sure they found jobs eventually. Technology opens up new jobs. The problem is the transition. And public policy can help making those transitions." Gretchen Buehner of King City talked about past migration westward from Appalachia and the south during hard times. Sheila Martin said it was unlikely to be repealed soon. "Most (Oregon) in-migration is from nearby states. I don't think the jobs that are growing are jobs folks in Appalachia are qualified to take. I hope we're growing from among our own folks." Bill Reid owns his own urban economic consulting firm PNW Economics. He was invited to talk Wednesday night because of his disagreement with the previous forecast. He is also on an advisory committee for MetroScope, the model that does the forecasting, and does consulting for land use planning and public finance for some small cities around the region. For the past three Urban Growth Report processes he's worked for different interests reviewing the plan's strengths and weaknesses. Metro will be leading its regional city and county partners though the next Urban Growth Report process. Different departments are working on different scenarios. MPAC is the key advisory committee to Metro Council because most of them are elected officials. They're getting input and advice. Part of our job tonight was to chime in on different economic trends and factors that hopefully the region will be discussing as they think about how much they are going to grow over the next 20 years." "The economic and population forecasting kicks off the process. They are working on methodology and forecasting now. It's an extremely complicated and data-driven process, as it should be. What we heard about tonight is the qualitative issues around the quantitative work that Metro's economists are doing. The idea was to put some qualitative flesh on the quantitative forecasting that is going to be happening." Forecasts are always wrong, but they still need pointers. "Most of what we talked about will be short term impacts. Metro's job is to forecast 20 years of growth. You try to put rails on where growth is supposed to go." "In 2013/14 they decided they did not need to adjust the UGB. The worsening housing affordability problem is a symptom of what I was disagreeing with." That was using 2010-2012 data, which was the worst of the recession. "Using that data is going to show results that bias probably not showing much growth. But by 2013 it was pretty obvious the growth was going to be more." The Urban Growth Report is Metro's big push for the next two years, and it takes a lot of time for all the stakeholders to review and discuss it. There were discussions of the housing affordability bond on the ballot this November, to pay for affordable housing in the three-county region in the UGB. "Mayor Doyle was grateful I pointed out we are almost down to nothing when it comes to industrial land. We're years and millions of dollars off being able to see the land there is." The region needs land for existing companies to grow, let alone attracting companies for companies from other states who might want to come here. When they see this, they move along. "We don't have place to accommodate employment growth, then we don't have jobs so people can afford housing, and we continue to be a Cupertino California, an exclusive community not necessarily dependent on jobs. We lose companies to other places and fall further down the rabbit hole of being viewed as 'There's no place to go there.'"